Indeni Insight is a continuously updated database that provides the global network and security community with the data to understand how devices behave in the real world. By democratizing this data, Indeni enables engineers and architects to make better decisions, and write better code. Each installation of the Indeni Automation Platform collects millions of metrics in its on-going operation – from basic CPU and Memory usage to in-depth device type-specific metrics. These metrics are then analyzed by a rule engine for the generation of issues. The Indeni Insight component of the platform collects issues, metrics and additional device data, and sends it to a central database. All of the data collected by Indeni Insight is non-confidential – it has no personally identifiable information, no company-identifying information, no devices names, and no IP addresses. This allows us to give everyone access to the data, without posing a risk to any Indeni user. Please Note that Insight requires access to “service.indeni-ops.com” over ports 80 (HTTP) and 443 (HTTPS). The top of each report gives an overview of the current license utilization, version in use, best practices followed and work hours saved. Whether you are evaluating new network or security devices, or looking to lower the TCO of your existing infrastructure, with Indeni Insight you can benchmark your performance across your peers and make informed decisions. The device overview section shows the models and versions of software used in your environment, compared to other users connected to Indeni Insight. It is a great way to know if you are in line with other users of the same devices. Data Collection, Transfer and Storage within each instance of Indeni, there is an Insight Data Collection component which injects itself into specific data write functions within the systems. When a configuration change is done in Indeni, or when an issue is generated, this component saves a copy of the data. The component collects only specific types of data and specific fields. It particularly selects data that we know is not confidential. This is essentially a white-list concept, where only data that is allowed will actually be collected. It ensures that no confidential data is collected by accident. The data is saved locally on the hard drive of the machine running the Indeni server. Once an hour, the data is compressed and sent to a dedicated S3 bucket in Amazon Web Services. This bucket is write-only externally, which means data can only be written to it, but not retrieved from it. A series of AWS Lambda Functions are triggered when data is uploaded. They process the data, verify it, and insert it into the global MySQL database described below. Please Note: Actual End-Users will need to replace “me@indeni.com” with your email. Make sure you use the same email you are using to access Indeni Crowd (http://community.indeni.com) and that you have at least 1000 points in the community. You should receive an email within minutes with the database access information. The database has a series of related tables, and then views that are built on top of them to make querying easier. 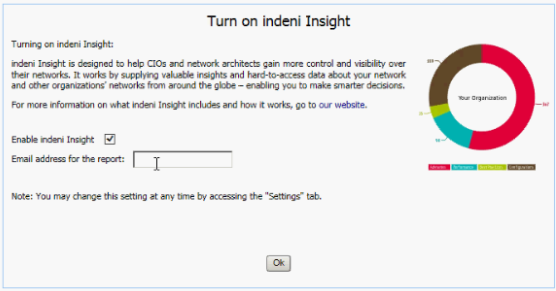 As a new Indeni customer simply follow the Indeni Insight set up instructions during system installation. If you need assistance, or additional setup, please see our article on how to install manually. If still have outstanding questions, please let us know in the Indeni Crowd!